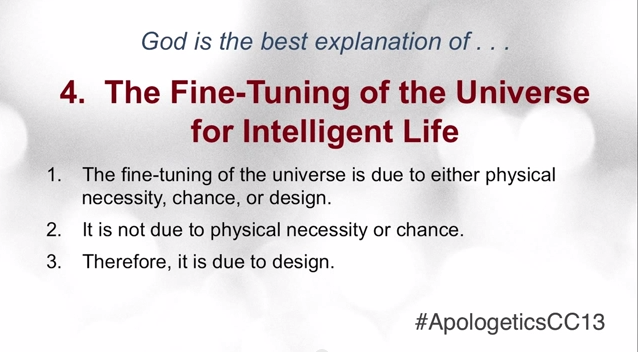 Among Christian apologists, what is termed “The Fine-Tuning Argument” appears to be one of the most popular arguments for the existence of a god. The hypothesis is that there are numerous physical constants and conditions that must be met to very close tolerances before life could arise and be sustained in our universe, so this universe must be the work of a creator god. Then, of course, some of those fine-tuning parameters could be very different from what they are and still allow life to begin and survive. Quite a number of extremophiles, organisms which can survive in extreme environments, have been discovered in the past few decades; in virtually boiling hot springs, at deep sea vents, and in the dirt several miles below the earth’s surface, for example. Thus, earth could have been well outside the “Goldilocks Zone” - at the right distance from the sun for surface water to be liquid - and still given birth to life. It has even been conjectured that life could exist in the gaseous atmosphere of Jupiter, or under the ice on some of the moons of other planets in our solar system. It could also be that Big Bang type events have happened billions of times, with nearly all being duds because the physical constants and conditions did not enable those universes to hold together, or otherwise failed to fit the requirements for life to arise. In other words, universes might be quite common, so it’s a virtual certainty that out of so many “rolls of the dice,” purely by chance, one would finally come along that was “perfect,” or nearly so. With a little research I have uncovered several other clever counter-arguments that non-believers might arm themselves with. "[A] universe that produced us by chance would have to be enormously vast in size and enormously old, so as to have all the room to mix countless chemicals countless times in countless places so as to have any chance of accidentally kicking up something as complex as life. And that’s exactly the universe we see: one enormously vast in size and age." That is, if there were a god, there wouldn’t be a need for trillions and trillions of stars and billions of years, there would be a need for only one planet. All the rest would be superfluous and exceedingly wasteful of a brilliant designer-god. Next, we have to ask whether fine-tuning was necessary for the designer to exist. Presumably, the designer existed before there was a universe and any fine-tuning. 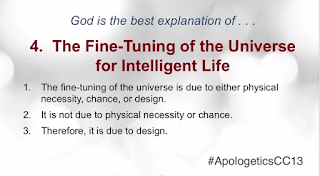 If there is a god, and he is “alive,” then clearly life CAN exist without all these finely-tuned parameters. Thus, the argument is self-refuting. So, if God had to fine-tune the universe to a particular set of constants and conditions because not doing so would not have allowed him to bring life into existence (and as they claim in their argument, a different set and there's no life), then God is not omnipotent. In fact, if god had to work within some set of rules like this, then this implies another deity superior to god. Ultimately then, the fine-tuning argument is quite vulnerable to attack from many different angles. And please note that I have only described a few of my favorite counter-arguments; there are others, should you wish to research the topic. Although, if you can’t budge your believer with any of these, then you might as well just laugh at his ignorance and ask whether he’s seen any good movies lately. How Do You Know Your Missionaries Aren’t Lying?